We cannot underestimate the value of trust. Research consistently shows that we are naturally seeking safety. In the “Aristotle Study”, Google found that the key differentiator between teams that were high performing and those that were less so (with all factors of intelligence, education, commitment etc. being equal) was that greater safety and trust was established in the high-performing ones. Trust is easily broken and difficult to repair. A client of mine lost trust when one of her key team members shifted to working in another part of their organization. Why was her trust lost? He hadn’t discussed the opportunity with her until he had already accepted the other position. As a result, my client felt betrayed and that he did not honor their relationship or appreciate all she had done for him. From her perspective, he had failed to consider his mentor and broke their relationship. Most likely, he was nervous about changing positions and may have been uncomfortable broaching the topic with her. However, they both failed to discuss the impact of the situation. While they were polite on the surface, my client’s demeanor became cold and distrusting. To make things worse, she was also angry at her colleague who hired him without first discussing it with her. Ultimately, the bad blood created hurt my client. They did not rebuild their trust, and he began to speak negatively about her. It took a lot of effort to rebuild the relationship and for my client to improve her reputation. This situation resulted in a lack of an open-minded conversation. It’s regrettable that the lack of trust took a lot of energy. Yet it is not uncommon. Often there are systemic issues that contribute to a lack of trust. For example, there are different assumptions and expectations regarding roles and responsibilities. The sales group is expecting more support from product development and speaks negatively about the group. Again a conversation is needed about roles and expectations and norms. We so easily make assumptions and believe our view is correct. Notice when you begin to lose trust with a colleague, neighbor or family member and give empathy to yourself and the other and work to repair the relationship with an open-minded conversation. 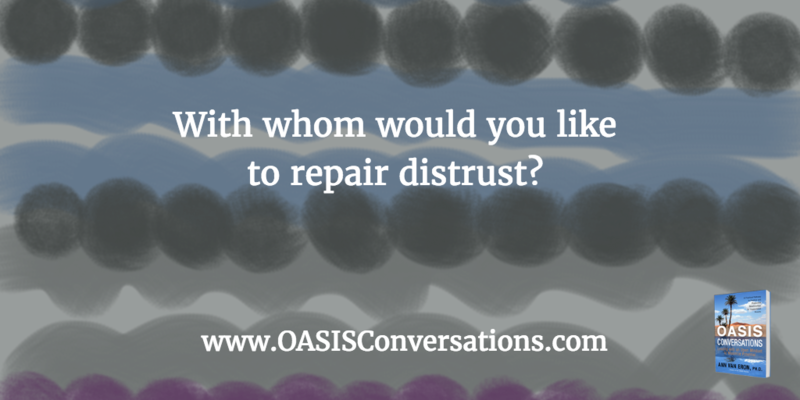 With whom would you like to repair distrust and rebuild a relationship? This entry was posted in Communication, intention, Mindset by Ann Van Eron. Bookmark the permalink.